Advanced users have the option to edit the HTML source code in most Rich Text Editors. This function has been disabled for some Title fields that already link to other pages. (eg. Gallery titles link to a gallery page). In the Rich Text Ediors, use the edit HTML source button to open a popup window displaying editable HTML code. 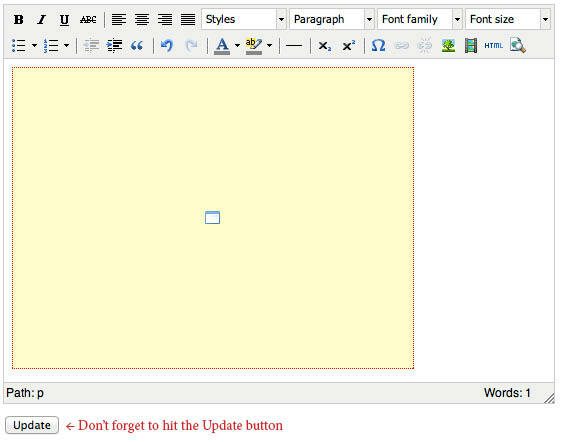 Edit HTML Once you have entered / edited the HTML, Click the "Update" button which will close the pop-up window. Don't forget to Click the "Update" button at the bottom of the page to save changes. 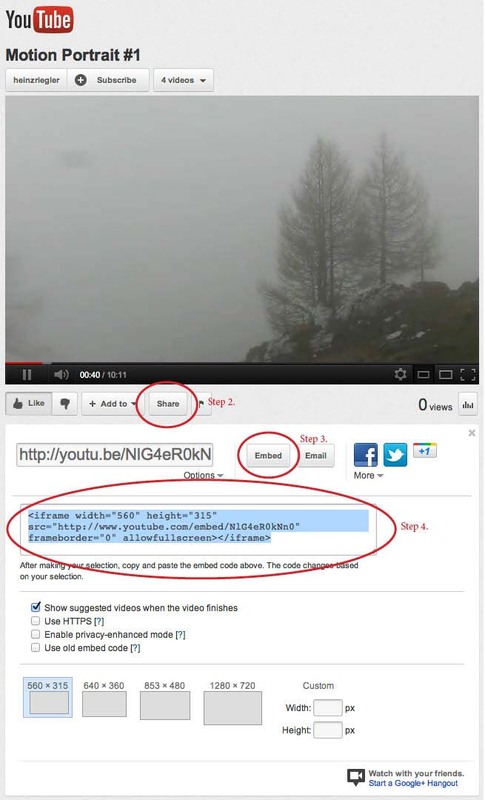 You can not upload video directly to your site however you can add video from Video sharing sites to any page of your website using the Rich Text Editors. Your first step will be to setup an account with a Video sharing site. Two of the most popular sites are Vimeo and YouTube. Click the logos below to vist their sites. Once you have opened an account and uploaded some video, you will be provided with some embedded code to use on your website. You can add video from Video sharing sites (like YouTube and Vimeo) to any page of your website using the Rich Text Editors. This function has been disabled for some Title fields that already link to other pages. (eg. Gallery titles link to a gallery page). STEP 2. Click the "insert/edit embedded media" button in the Rich Text Editor. STEP 3. Click the "Source" tab in the pop up window. STEP 4. Paste the embed code (from STEP 1) into the window. STEP 5. Click the "Insert" button. N.B. 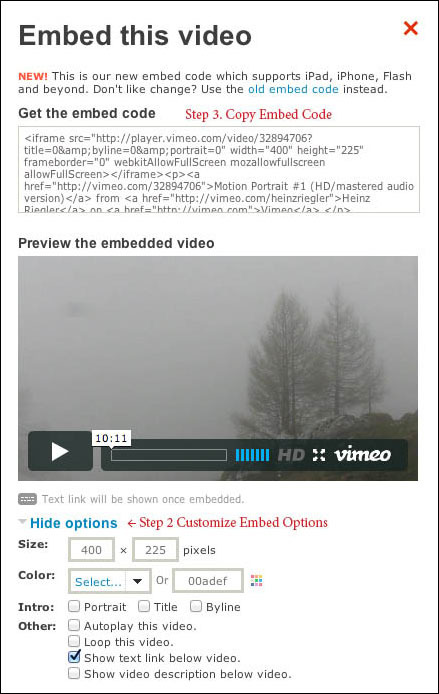 Your embedded video will not display in the Rich Text Editor and will be seen as a yellow box (see below). 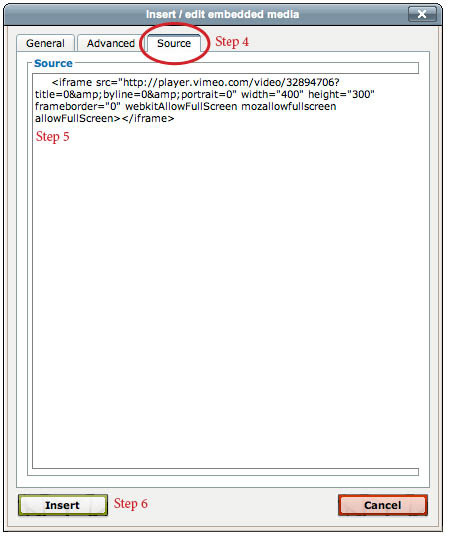 Preview your website to check that you video has uploaded and displayed as you intended. Step 1.Navigate to the video on Vimeo and click the Embed Icon which will appear after you click the video. Step 2.Customise the Embed options. Thanks to Heinz Riegler for letting us use his video for this instruction page. Winner for Best Short Film / Audiovisual Work at M.I.C.A TonBild 2011, Vienna Austria. When you first begin to setup your website you will see the words "Content Coming Soon..." on your HOME PAGE. 2. delete/replace the words from the Introductory and Concluding text boxes. 3. You can also format the this text and add images and video using the RichText Editors. 4. click the update button to save changes.